Did You Know There’s a Documentary About YOU? Here’s to an Uncomfortable 2018! Nan McNamara on Did You Know There’s a Documentary About YOU? Laurie Schnebly Campbell on Did You Know There’s a Documentary About YOU? Sue Kaup on Did You Know There’s a Documentary About YOU? It’s been almost three months since the royal wedding. And I can’t quite delete the DVR recording of it, even though I’ve watched the whole thing, seen the BBC highlights and read the People magazine story from cover to cover. A lot has been said about the reasons people have been and continue to be so fascinated by the event and this magical couple. The idea of a young woman from the United States becoming a real-life princess is a fairy tale come true. But I think most analysts boil it down to our desire to watch something positive in the news for a change, something hopeful. 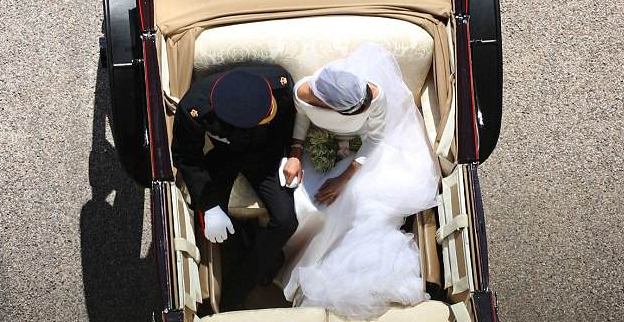 As I watched, I felt like a little kid – setting aside my cynicism and allowing myself to dream, to fantasize about Meghan and Harry’s lives as royals. “Well, am I not going? To Meghan’s wedding?,” Lola asks, dumbfounded. Her Mom tells her you have to be royalty – a prince or a princess to attend. And Lola responds through tears, “I don’t know what you mean!” She repeats this again and you can see the complete and utter belief that she thought she was going to the wedding – there was no doubt in her mind. Why wasn’t she invited? It didn’t make any sense to her. The purity and innocence of her pain was searing. As I watched the video of Lola, I cried right along with her. But I also marveled at her conviction in the outcome that she wanted. And it got me thinking: Could I apply a little of Lola’s ability to believe in the best possible outcome in my own life and career? What would it look like if we all started the day with an assuredness and utter belief in whatever we were trying to achieve? Children are like stars or flowers or animals, things that are what they are, unambiguously, uncomplicatedly. Why can a child immerse himself so eagerly and thoroughly in what he is doing? Because he can lose himself; because he is not looking at himself, conscious of the reactions, expectations, and approval of those around him. The best moments in life are when we lose ourselves in the world and just are as God wants us to be. So, Lola didn’t get an invitation to the Royal Wedding. And I didn’t either. What if Lola and I, and well, all of us continued to dream and believe . . .
just like when we were kids . . .
that it’s possible for us to . . .
Let’s be what God meant for us to be. Oh, I didn’t see the Lola video…but the thought of it breaks my heart. I like your conclusion — way to make the most of a sorry situation! Laurie, so true! There are some perks to being an adult and understanding life’s ups and downs. © Nan McNamara. All Rights Reserved.